New sounds about old sounds! Sound Souvenirs: New Sounds about old sounds! Who does not have one: a collection of personally recorded and deeply cherished music. On mp3-player and I-pod, or somewhere in a drawer: old cassette tapes and taper recorder reels. We now take it for granted that we use our audio equipment to record music. But for a long time, it was not so obvious to do so. When at the beginning of the fifties companies like Philps and Grundig brought the tape recorder on the market for the general public, the collecting of music was only one of the envisaged possibilities. The tape recorder, or so the manufacturers thought, would become a family album in sound, with on it the babbling of the baby and the singing of Sinterklaas songs. Things turned out differently. 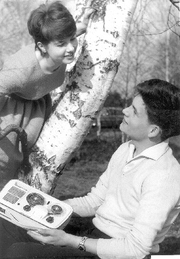 Tape recorder hobbyists became sound hunters, who sought special sounds not inside, but rather outside the home. Many "every day" users proved to be primarily interested in collecting musical recordings. That kind of relaxation did need some defense however. Thus, the storage boxes that BASF started producing for tapes were strikingly similar to books. By the time the cassette player was introduced however, it was all about music. Our team researches why this was the case, and why then. For, innovation is also culture. We will present the results in exhibitions, of which one will be in museum Het Domein in Sittard. There, we will create rooms that not only present the apparatuses, but also the expectations that there were about the cultural practices of their use. Above all, we will let the sounds of the fifties, sixties and seventies resound. In this way, we will recreate the past through sounds of the past. Our exhibitions will be exhibitions of sound. We have made an inventory of tapes that people still have at home. From these tapes we will make a selection to be digitalised. We will use these sounds for the sound exhibitions, but we also interview the owners about what they did with the apparatuses and what the recordings mean for them now. What do recordings from the past do with the way in which you look back on your life now? Finally, we will ask sound artists and young hip-hop artists to make new art with old tapes. Our team researches why this was the case, and why then. For, innovation is also culture. We will present the results in four exhibitions, of which one will be in museum Het Domein in Sittard. There, we will create rooms that not only present the apparatuses, but also the expectations that there were about the cultural practices of their use. Above all, we will let the sounds of the fifties, sixties and seventies resound. In this way, we will recreate the past through sounds of the past. Our exhibitions will be exhibitions of sound. We are currently making an inventory of tapes that people still have at home. From these tapes we will make a selection to be digitalised by the Meertens Institute in Amsterdam. We will use these sounds for the sound exhibitions, but we also interview the owners about what they did with the apparatuses and what the recordings mean for them now. What do recordings from the past do with the way in which you look back on your life now? A radio or multimedia production will be made about this. Finally, we will ask sound artists and young hip-hop artists to make new art with old tapes.